DISCLOSURE: This post contains affiliate links, however, the opinions expressed are all mine! Note: I only promote and share products I personally use and recommend! To learn more, please review my disclosure policy here. 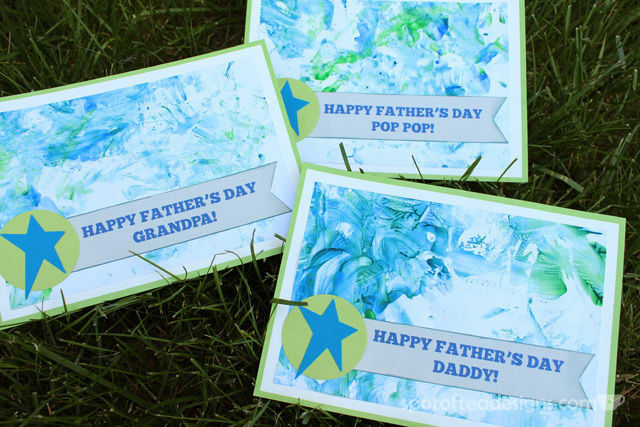 (which you’ve already seen us use in her Valentine’s Cards and Mother’s Day Cards) and we worked up some custom designs for grandpa, pop pop and daddy! 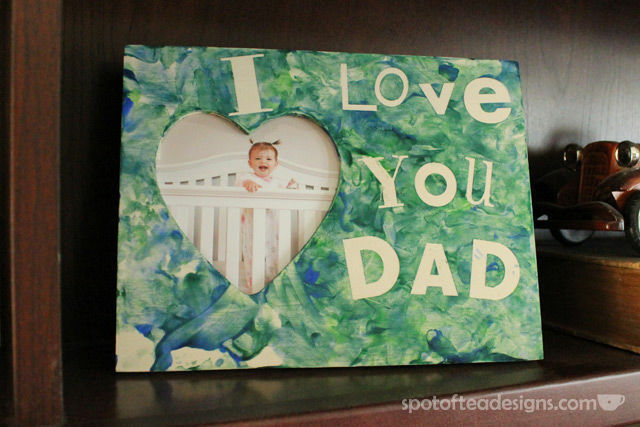 For dad, we planned to make a frame using a fun sticker resist technique. And for everyone, we went with our fun fingerpaint background cards. First I stuck stickers onto a plain wooden frame. It didn’t matter what colors or fonts they were as they would be removed later. 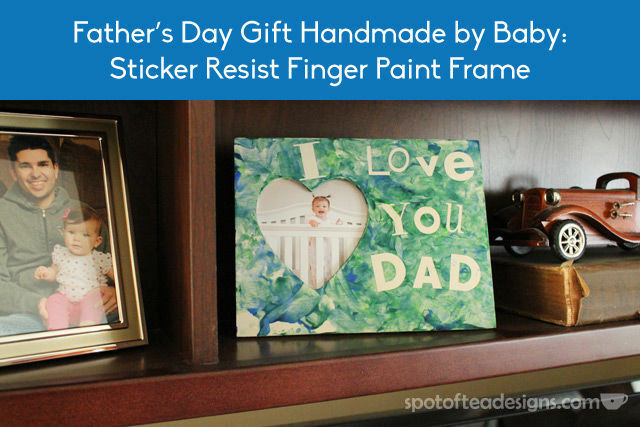 Yep, just like when we made our Mother’s Day cards, she was more obsessed with the paper plate full of paint than the actual paper surfaces. 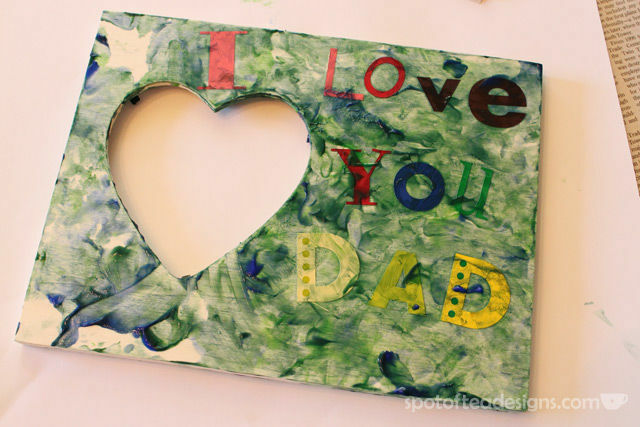 The intention was for her to have fun and paint the frame and sheets of paper. After some coaxing and eventual playtime with the paper plate, we achieved our goal. It’s beautiful, isn’t it? This is what happened after her playtime. I let it dry like this for a while before peeling off the stickers. They acted as a resist, allowing the plain wood surface to be protected. Slap in a cute photo of her making this recent funny face she makes and we have a fun baby made Father’s Day gift for Derek’s desk! Super cute!! 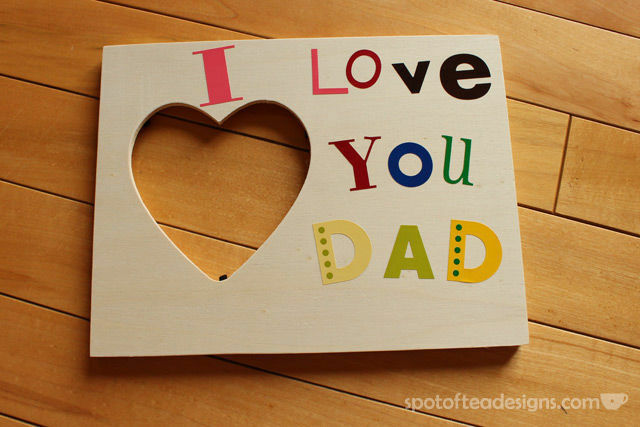 We love giving handmade gifts!! It’s adorable when they are young!